We are happy to introduce this week's guest blogger and friend, Kate Bales, who shares her story of sibling loss. 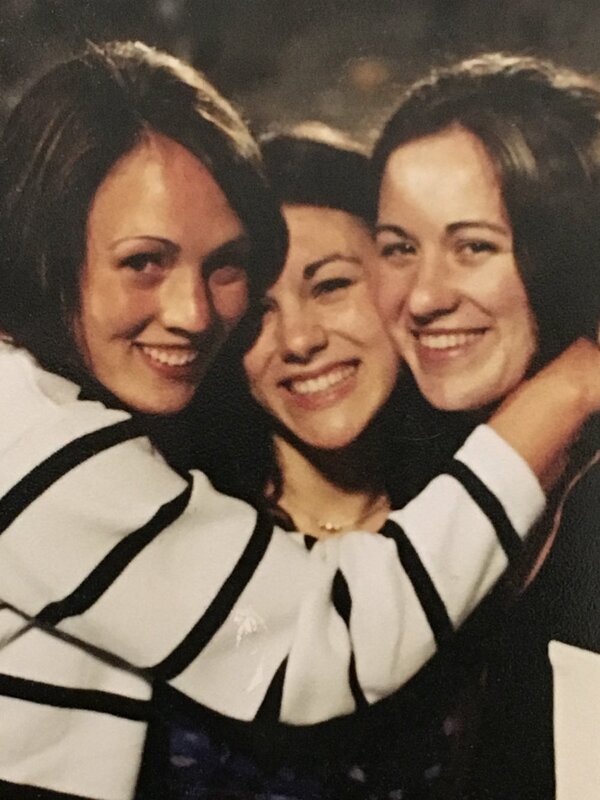 Like our family, Kate enjoyed a special and close bond with her sisters. She was the oldest of three girls and lost her youngest sister, Beth. Sadly, Beth was only 20 years old. Kate shares a touching story of coming to terms with such a significant loss and finding comfort in signs. It’s hard to believe my sister would have turned 35 this month. It’s also hard to believe that she has been gone for fourteen years. However, the hardest thing I have to believe is that my sister is not coming back. I still remember small instances of my disbelief on the day I found out. I was in graduate school. At that time, my roommate was the youngest sibling of old family friends. She was a special friend to my sister, Beth, when they were little. My roommate’s mom had been battling cancer for a long time and I knew her end was near. So when I returned to the apartment from an errand and she greeted me at the door with tears, I didn’t understand why she told me to call my parents. I remember my heart sinking for her and thinking it was odd that she would want me to call my parents for them to tell me that her mother had passed away. I went back to my room and dialed my mom’s phone number. I could hear the hushed, urgency to my mom’s voice that she always uses when she has bad news. She told me they were in the car with my aunt and uncle who were driving them down to Milledgeville where my youngest sister, Beth, had been killed in a car accident. They were headed to the hospital to identify her body and even though she had just said Beth was dead, the mention of a hospital gave me hope. I asked if they still might be able to fix her. I didn’t want to believe that she was really gone and not coming back. In the foggy aftermath I learned that Beth had been driving back to her college apartment after hanging out with friends when her car was t-boned by a driver who ran a red light. For a while after her death, it was easy to pretend that she was still away at school. Even though I thought about her absence everyday, I didn’t have to feel it because I was used to being out on my own and away from my family. I think her instant death also made it easier to believe she was still around. I didn’t have the long days of agony and then hope and then agony that I imagine is felt by those who lose a loved one to sickness. My sister was here one day and gone the next. It wasn’t until the second Christmas without Beth that her absence really hit me like a kick in the gut. Christmas was a time that we were supposed to be together. I had prepared myself for the first Christmas but when the second came around I had let some of my guard down. I remember sitting in church with my parents and my middle sister, Ashley (I am the oldest of three girls). I noticed that we didn’t take up as much room in the pew. The visual reminder that we were now a family of four made me cry. It can be very tough to think about Beth. However, there are many times that I can think about my little sister and smile. Beth was a superstar! She was funny, dramatic, loud, and enormously loving. She was the only person I know that got a parking ticket while parked to pay for a parking ticket. She didn’t pause for a moment before going down to the local nursing home to take her sorority’s “adopted grandma” out on a date. She would throw the sweet lady’s walker in her car and whisk her off to get ice cream. She could talk to a stranger and wasn’t afraid to do what she loved. I admired and benefited from this quality in Beth. I often asked her for help in social situations. Once when I was feeling very shy about selling school, fundraising calendars, Beth took me out, knocked on doors and sold all my calendars! I still ask for Beth’s help. When I feel sad, anxious or fearful, I will talk to her. She may not be able to physically answer me but I look for comfort from her in songs that come on the radio, glimpses of butterflies, etc. An example of the comfort from butterflies came at my grandfather’s funeral. My grandfather was being buried at the same cemetery that Beth had been buried at years before. After his funeral service, I walked over to Beth’s grave sight. On my walk, two white butterflies fluttered close by. I had once heard a saying that butterflies are angels in disguise. Even though it is just a sweet saying, seeing those two butterflies brought me comfort. It felt as if Beth was telling me that she and my grandfather were still with me. So even if I have to believe that Beth is not coming back, I choose to believe that she is still near. Aug 30, 2018 Telling Our Story: Is This OK?